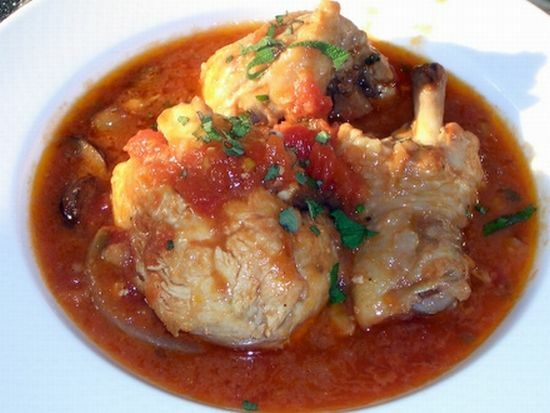 Chicken Cacciatore is a traditional Italian dish combining chicken, mushrooms, roasted bell peppers, tomatoes, oregano, onions, anchovies and basil leaves. 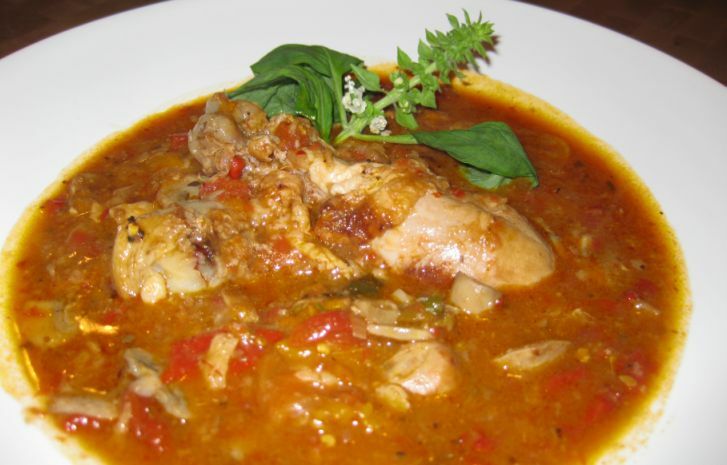 Usually dark meat is used, which is fattier in order to yield a more luscious sauce. Usually the meat is cooked until it literally falls off the bone but I like my meat to be in one piece so I cut the cooking time by a good 20 minutes. 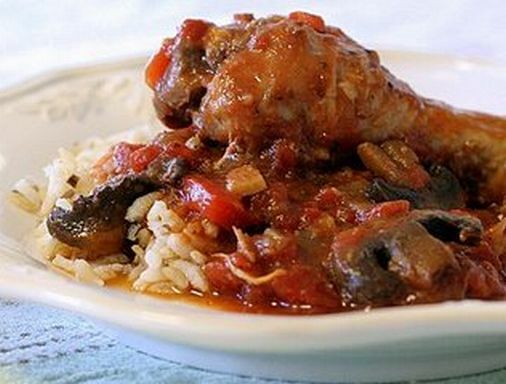 Chicken Cacciatore can be served alone with a good loaf of bread so soak up all the goodies, or it can be served with pasta or rice. 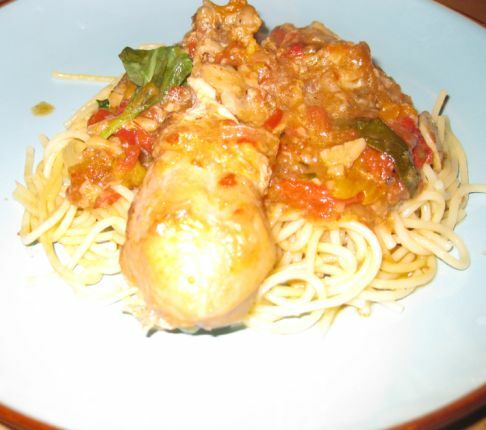 Chicken Cacciatore is fairly easy to prepare and it is a wonderful dish to prepare for large parties. Even tough the dish is a bit lengthy so plan accordingly! Here the dish is served with rice. This actually the left over and it actually tasted it even better the next day. 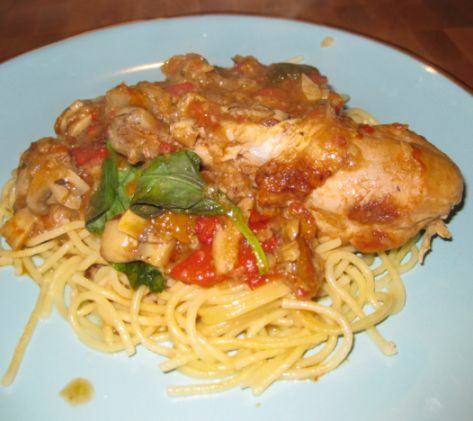 Chicken Caccitore is definitely a comfort food. The flavor of this dish is so wonderful and so tasty. 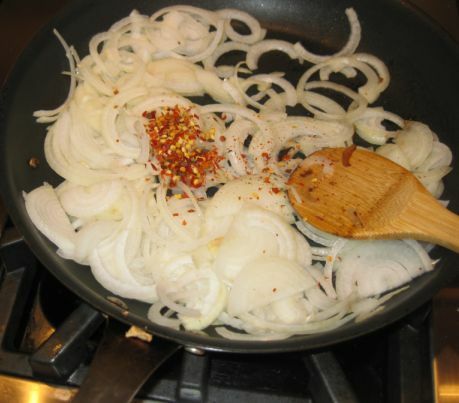 Sliced onions and flake peppers are sautéed in a hot pan until the onions are brown, about 5 minutes or so. 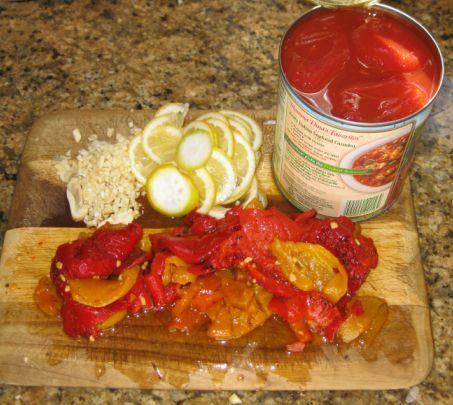 While the onions are cooking, I am preparing the base of the Cacciatore by chopping roasted bell peppers and garlic, slicing thinly 1 lemon, and hand crush the can of whole tomato. 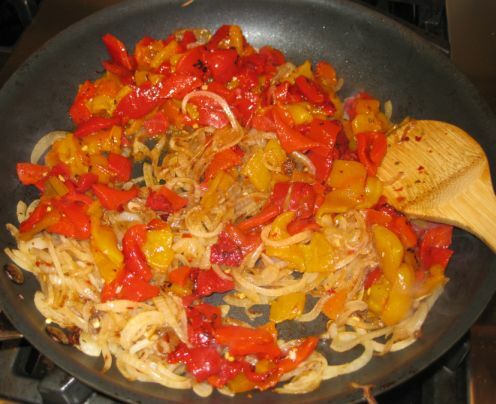 Once the onion are brown, bell pepper and garlic are added to the pan and are sautéed for a few minutes. 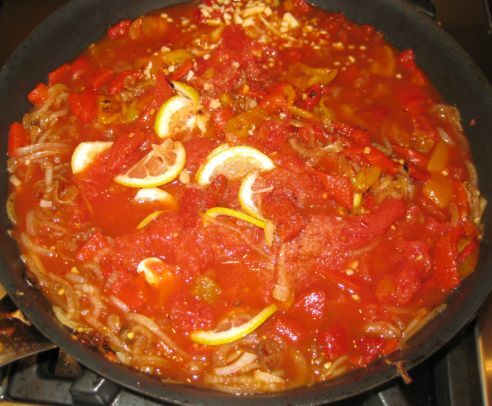 Next, add the lemon slices, hand crush tomatoes, anchovies, oregano, and garlic to the pan and let it simmering for a good 20/30 minutes. This is the base of the Cacciatore. 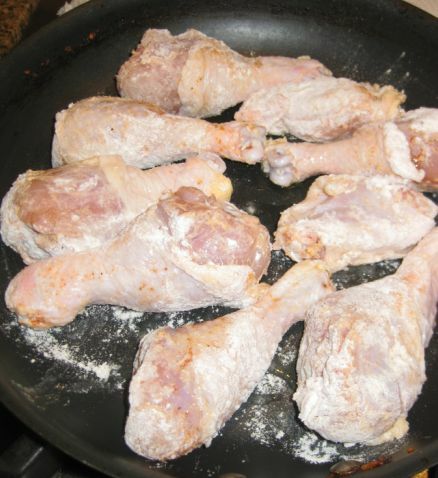 While the base is simmering, I am browning the chicken lightly coated with flour. 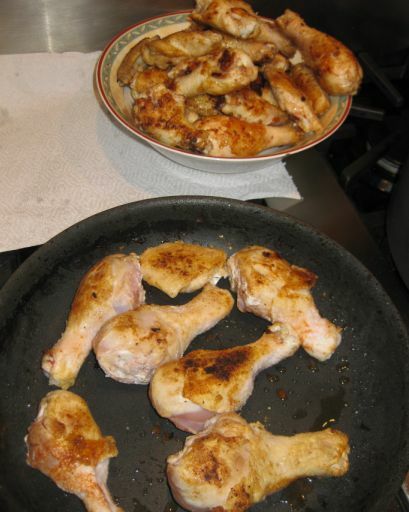 The Chicken are nicely brown and are put aside. 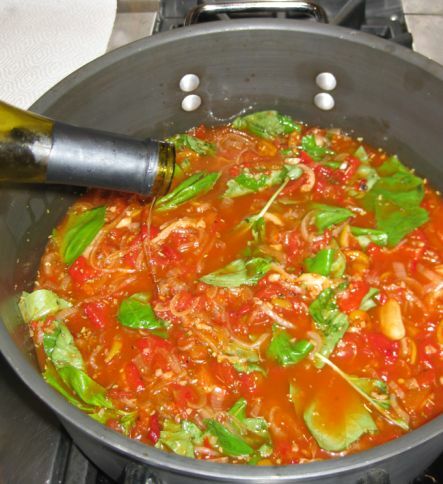 After simmering for 30 minutes, I am adding white wine and basil into the pot. 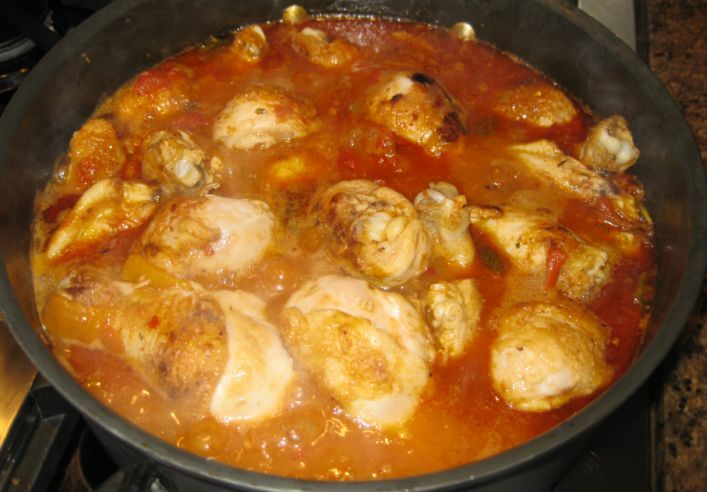 The chicken is added to the pot and again let it to simmer for another 30 minutes or so. 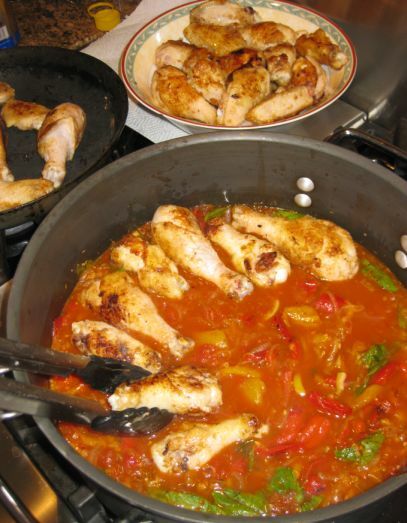 The Cacciatore is not ready to be served.